James Franklin Jaudon was born in Waco, Texas on October 19, 1873. Early in his youth, Jaudon moved with his parents to Orlando, Florida where he attended public schools and studied with private tutors. At age 15 Jaudon started work as a clerk in the mercantile trade. He also joined the army. In 1895 Jaudon left Orlando with his brother Paul to establish a mercantile business in Miami. He also helped organize Company L, Second Battalion, Second Infantry, Miami, serving as sergeant, lieutenant and eventually captain and post commander. Jaudon married Maude A. Coachman in November 1911 and the couple settled on N.W. Fourth Avenue in Miami. Captain Jaudon retired from military service in 1912. In 1917 Jaudon established the Chevelier Corporation and served as its President. The corporation purchased extensive land holdings in Monroe County in southernmost Florida. Other business interests of Captain Jaudon included the Tamiami Railway, the Royal Palm Sugar Cane and Planting Company, the Tamiami Trail Committee, the Florida Rubber Company, the Tamiami Trail Land Company, the Perrine Mercantile and Investment Company, and the Heitman Estates/Bonita Springs development. Jaudon was involved in most road construction projects in Miami in the 1910's and 1920's, promoting both the Ingraham Highway and Tamiami Trail projects. He invested considerable funds of his own to extend the Tamiami Trail eighteen miles from Miami west through Dade County. Indeed, it is the Tamiami Trail for which Captain Jaudon may be best remembered. 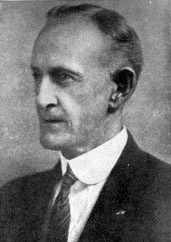 The idea for building a highway to connect Florida's east and west coasts originated with Jaudon while he was serving as Dade County's tax assessor in 1915. As a landowner with interests in several townships south of the proposed Tamiami Trail route, Jaudon had high expectations for development and agriculture once the roadway was completed. His Chevelier Corporation financed much of the road construction for the Trail in Dade and Lee Counties. By 1918, Dade County had completed 43 miles westward from Miami. On Florida's less populous west coast , road construction was considerably slower. When the project faced delays due to lack of funding, wealthy landowner Barron Collier offered to finance the operation under one condition: the creation of a new county named for the real estate magnate. Collier County was thus created out of the southern part of Lee County. Jaudon and Collier battled over the Tamiami Trail's location in southwest Florida: the dueling land developers pushed to locate the road in their respective tracts. The state resolved the problem in favor of Collier, thus creating the 'dog leg' in the middle section of the Tamiami Trail. In April of 1928, thirteen years after its inception, the 283-mile Tamiami Trail was completed. The peninsula's two tropical coasts were at last connected, and life in south Florida was forever changed. In the 1930, Captain.Jaudon moved west to Ochopee, Florida to pursue his business endeavors -- a sugarcane plantation, rum distillery and logging operation. He was the first postmaster of Ochopee. A few years later, Jaudon prepared histories of Lee and Collier Counties for the Federal Writer's Project. He was also involved, along with other landowners in Dade and Monroe counties, in negotiating the boundaries of the proposed Everglades National Park and establishing prices for land sales. James F. Jaudon -- Miami pioneer, entrepreneur, community leader and "Father of the Tamiami Trail" --died in 1938. Photograph of Captain James F. Jaudon, 1926.